In another case, a pharmacist forged a prescription for Vicodin — hydrocodone combined with acetaminophen — to his bulldog, Stella Rose, then dispensed the 25 pills to himself and “ingested two pills for the half-hour car ride to his home in Rumford,” according to the state records. A pharmacy technician does much of the routine work involved in filling prescriptions, from taking refill orders to actually filling prescription bottles. Each filled prescription is supposed to be checked by a licensed pharmacist before it is given to a customer. Pharmacy technicians do not need more than a high school diploma to be licensed and are trained on the job. • The pharmacists and pharmacy technicians who were investigated and disciplined because they failed to disclose their criminal history when applying to practice in Maine. • The pharmacist who owned a pharmacy in Waterville, took a job elsewhere and put his mother in charge of the Waterville pharmacy, where she dispensed medications — even though she wasn’t a pharmacist. Among the largest number of cases are the ones where pharmacy employees steal drugs. 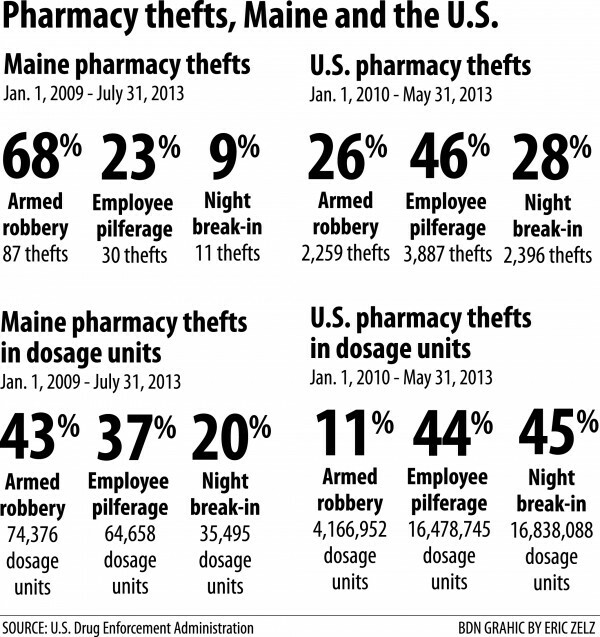 It’s not a problem unique to Maine: The U.S. Drug Enforcement Administration says that for the last three years, “employee pilferage” has constituted the largest single percentage of pharmacy thefts nationwide – 46 percent vs. 26 percent for armed robbery thefts and 28 percent for night break-in thefts. In terms of dosage units — the amount of drugs stolen — employee theft is 44 percent, night break-in is 45 percent and armed robbery is 11 percent. They may not be in care because they’re not being detected. While 58 thefts came before the board between Jan. 1, 2003, and Dec. 31, 2012, only one new theft was brought to the board between Jan. 1 and Aug. 30, 2013. “One of the efforts in the next three to five years is everyone’s going to have to be a certified pharmacy technician,” said Bruno, which requires additional training and certification by a national board. The Maine Center for Public Interest Reporting is a nonpartisan, nonprofit news service based in Hallowell. Email: mainecenter@gmail.com. Web: pinetreewatchdog.org.